The Cleveland Plain Dealer will be one hundred years old on January 7, 1942. It has seemed to the publishers only right and proper to make the birthday an occasion for rendering some public account of their stewardship, as much on behalf of the great and honorable company of gentlemen now gone to their rewards, who labored incessantly in this vineyard, as by way of apologia for those who still carry on. But a larger reason for telling this newspaper story is the fact that the future always depends upon the past, and out of this rich past we take hope for a still worthier future. 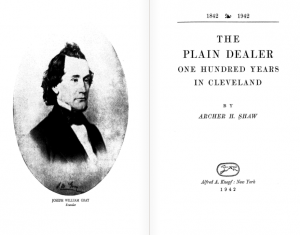 The Plain Dealer has been singularly fortunate in having had on its staff an able, modest, and scholarly associate editor, Archer H. Shaw, for thirty-odd years its chief editorial writer, who set himself long ago to make a study of the paper’s history. For many years he envisioned as the crowning labor of his life the compilation of this narrative, which he has now completed. If the reader detects in the book any trace of partisanship in favor of the Plain Dealer, it grows out of the author’s great love and fierce jealousy for the good name of the institution which has been his life.